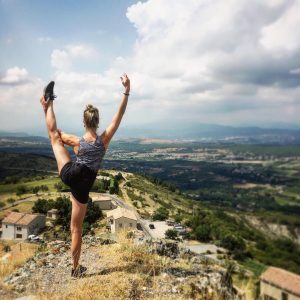 Meet Karin Lambrechtse: dancer, dietitian, chef and author of the book ‘Sportables’, a cookbook with recipes for athletes. 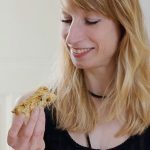 Karin will blog about nutrition for performing artists every month and share her delicious and healthy recipes that she has developed to help maximise your performance. We can’t wait to get cooking (and eating)! But first here’s a short interview with Karin to get to know her a little better. At this moment I work at various places/institutions and companies. In 2017 I opened my own practise as a dance dietitian in Arnhem where I meet dancers of all ages from across the country. Besides that, I teach nutrition at Artez and Fontys. For Topsport Gelderland I organise cooking workshops for young athletes and their parents, and I work for the KNZB where I give nutritional advise and guide 6 Paralympic swimmers. But my main job which I started this year is being a chef and FoodCoach coordinator for our Dutch World Tour Cycling Team Jumbo-Visma. This means that I am on tour with 7 cyclists and cook personalised meals for them. I grew up in the north of Holland. As a child I participated in a lot of sports, like korfball, horse riding, ice skating and gymnastics. After seeing a performance of NDT and of Duende (a Dutch dance company) it hit me… Those dancers were so beautiful, the movements so perfect, so organic, musical and inspiring. I didn’t want to ‘move’ anymore to win, to be ‘the best’, I wanted to move to share, feel, to tell a story. I started with modern dance at age 14 and ballet at 16. Some people said: no way you will get into a dance academy starting ballet so late. But thank god I followed my dreams and went for it and did. During my 3rd year at Artez I got an internship in Introdans which resulted in a contract afterwards. A dream come true. At Introdans I danced for 11 amazing and beautiful years. In 2013 I quit because I always knew I wanted to stop at the top of my career. After I quit, I worked as a freelance dancer and choreographer in Europe and started studying Nutrition. Slowly my focus turned more and more to nutrition and dancing/performing became less and less. A natural process, but as much as I truly enjoy my life and work now, I do miss dancing and performing every day. What was your favourite snack when you were studying Dance? When I was studying (1998-2002) we didn’t have all those sport-foods and on-the-go/take away meals and snacks we see everywhere around us today. At school we had a small canteen and two ladies that made fresh food every day. Not at all the right foods for optimal performance and recovery (I know now…) but tasty food; yes! Pasta with lots of garlic and oil, fatty empanadas, tosti’s and full fat yoghurt with sugary granola. It was ‘heavy’ food. There was no one that gave us tips on what’s best to eat or when and how much. Some teachers glared at us when we were eating which made us stop eating when they would be around. We also had a German ballet teacher that didn’t allow any water in the studio. Thank god, these things don’t happen anymore! But to answer your question, my favourite snack back then was (and still is) just a piece of fruit: light, fresh and energizing. Plus a peanut butter sandwich. I am a true peanut butter addict. Why does nutrition matter for performing artists? Nutrition is important for everybody, for our overall health. But especially for performing athletes, because their body is their instrument. Our instrument can only function at this high level of physical demands and pressure if it gets what it needs: fuel, fluid and recovery. These can be given to our bodies by specifically eating the right foods at the right time. Next to that aesthetics play an important role in how performance athletes might relate to food. In order to build a strong, athletic but lean body a performance athlete is challenged in multiple ways, because it’s (almost) impossible to gain muscle and lose weight at the same time. I personally think it’s important to truly understand and accept our own body. The perfect performance body is not that of someone else, or an Instagram picture made perfect. It is your body and your body alone. You can sculpt it by taking care of it and nutrition is one of the best ways to do so. What would you like to teach students with your recipes? That food gives us more than energy alone. Food is life! It protects us, it makes us stronger, it makes us grow, it makes us feel, it’s fun, it communicates to us and within us, it feeds and fuels body and mind, it helps us recover, it cools us down or heats us up, it makes us feel happy and it connects us to others! Pizza! A freshly home baked pizza with tomato sauce, parsnip, red paprika, tuna, zucchini, black olives, garlic, tofu, onion rings and a salty honey-thyme dressing.